Aircraft Thrust Reverser Market size was valued over USD 1.3 billion in 2016 and is projected to cross USD 2.2 billion by 2024. Rising safety regulations along with growth in commercial aircraft are the key factors driving the industry demand from 2017 to 2024. Deployment of the product offers decreased landing distance, early stopping and reduce wearing of brakes. Increasing disposable income resulting in growth in air travel and tourism will fuel the demand for commercial airplane. Moreover, affordable flight prices and increasing FDI in aviation industry will drive the aircraft thrust reverser market size over the forecast timeline. Enhancement of operational safety with installation of thrust reversers are the prime focus area of the manufacturers and service providers. Continuous safety checks of the aeroplane body and engine maintenance will positively boost the aircraft thrust reverser market growth. Complexity in design along with higher cost required for the manufacturing the product may affect the industry growth. Industry participants are focusing on reducing the manufacturing cost with implementation of automated processing of the material and improving the cycle time. Cascade contributes the major volume share of around 70% in 2016 owing to implementation of the system in widebody, single aisle and regional jets. Increasing demand of the aeroplane for commercial travel will boost the aircraft thrust reverser industry growth. Pivot door thrust reverser will witness significant growth at around 4% during the forecast timeframe. Superior performance of the product offering decreased braking distance along with cost benefit of the product. Bucket thrust reverser will exhibit significant growth up to 2024. These are deployed in all conventional planes and utilizes hydraulic actuators & pushrod system. Rising MRO activities particularly in the emerging region will further support the aircraft thrust reverser industry growth. In 2016, small widebody aircrafts generated over USD 200 million owing to increasing passenger travel along with rising commercial fleet. Implementation of advanced technologies focusing on adoption of composites for manufacturing thrust reverser will further support the industry growth. Single aisle aircrafts hold the maximum volume share and is expected to continue its dominance over the forecast timeframe. This can be credited to superior demand of the product around the globe. Growing demand of the airplane from emerging economies will fuel the industry growth. Aircraft thrust reverser market from regional jets will witness rapid growth over at 4.5% by 2024. Increasing investment in aviation sector owing to superior profit margin will fuel the industry demand. Moreover, optimised capacity offered by the regional jet will positively influence the product penetration. Hand layup process dominates the revenue share, generating over USD 650 million in 2016. Ease in usage, low cost and used for mass production are the prime factors influencing the adoption of the process. Resin infusion will depict significant growth during the forecast timeframe owing to superior finish achieved for the product. It eliminates the post fabrication work and produces thick shaped components required for the airplane. ATL/AFP will depict strong growth over 4.5% up to 2024. Industry players are implementing automation in manufacturing process assisting in mass production. Adoption of advanced manufacturing techniques using computer guided robots for laying carbon fiber in mould will drive the aircraft thrust reverser market share. Hydraulic system dominates the market size owing to ease in installation and operating of the product. The system is deployed on CF34, TFE731, PW4000, CF6, JT9D, TF39 and RB211 engines of Airbus and Boeing planes. Electric system will witness strong growth around 5.5% by 2024. 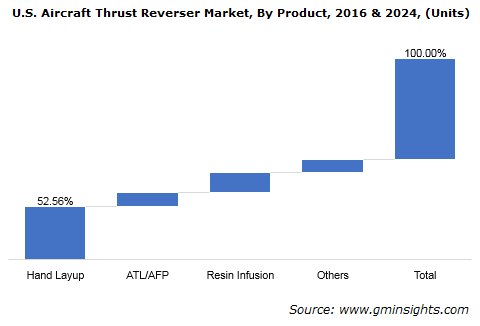 Elimination of corrosive hydraulic fluids, easy maintenance, reduced weight and simplified design are the prime factors boosting the aircraft thrust reverser market growth. North America dominates the aircraft thrust reverser market accounting over USD 750 million in 2016. The high revenue generation can be attributed to presence of various industry participants across the region. In addition, presence of strong passenger base in the region will further boost the market demand. Europe led by Germany, Italy, France and Russia will show significant growth at over 4% during the forecast timeframe. Stringent government regulations focusing on effectivity and higher utilization of the airplane will fuel the aircraft thrust reverser market demand. Industry players are focusing on implementing cost effective solution thereby improving the productivity. Asia Pacific led by China, Japan, South Korea and Australia is poised to grow at over 6% by 2024. Lower fares, increased flight frequency along with rising preference of air travel are the prime factors driving the industry growth in the region. Positive development in the aviation industry offering superior profit margin are influencing the foreign investment in the region. Safran S.A., Nordam, UTC Aerospace Systems, Triumph Group, GKN Aerospace and Spirit AeroSystems are among the prime industry players of aircraft thrust reverser market. 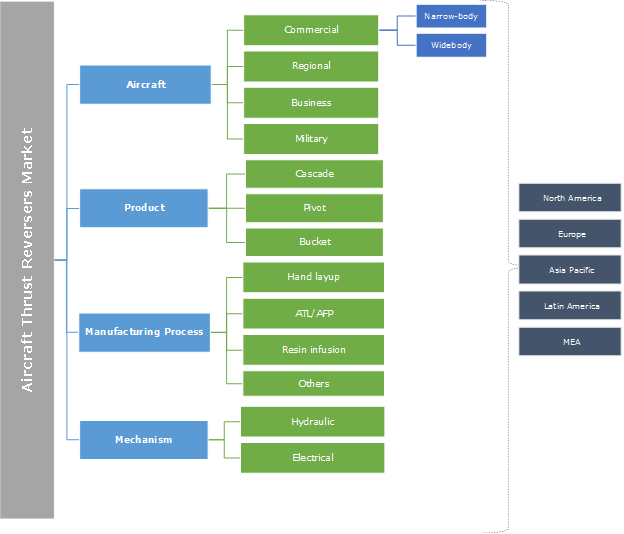 Manufacturers are focusing on development of optimized and light weight products sufficing the aerospace standards. Industry participants are developing long term contract with the airplane manufacturers and focusing on strategic collaborations for new product design. Superior dimensional stability along with precise design offering exact fit to the nacelles are the key focus points of the aircraft thrust reverser manufacturers. Moreover, implementation of precise technologies offering in process testing and inspection of the product using CMM machines are offering competitive edge in the industry. Aircraft thrust reverser penetration is boosting owing to shifting preference towards safety and short turnaround time. In addition to this, increasing air passengers owing to low fares will further fuel the industry demand. Aircraft thrust reverser offer less travel time during landing and cancelled take offs. In addition, these are also used during presence of ice on the runway. Mandatory installation and inspection of the product in airplane will fuel the industry demand.